If you follow the highway A9, you follow the direction “Beziers-Centre”. You now leave the highway A9, and by taking the highway junction A9/A75, you arrive to the exit “Beziers-Centre”. Directly after you left the highway, by this exit, you follow the direction “Béziers-Centre” until you find the direction “Bédarieux”. From this moment on you keep following the direction “Bedarieux” (D909),.After about 20 miles you take the exit ‘Laurens’ on your right. 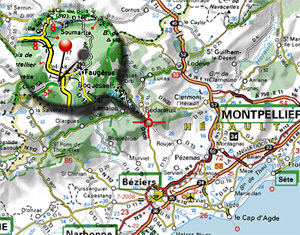 Immediately after the exit you turn left – Ancienne route national- 200m further turn rights – Chemin des barraques- After 20m you arrive at ‘lotissement les gênets’ . The second house on your right-hand side is n° 12, your destination. If you follow the highway A75, you take the exit ‘Clermont-l’Herault’. When you reached ‘Clermont- l’Herault’(Exit 57), you take the direction ‘Bédarieux’ (D908) for about 20 miles. Once you have reached ‘Bédarieux’, you must stay on the D908 and follow the direction ‘Hérépian’. At ‘Hérépian’ take the round-about direction ‘Beziers-Faugères’ (D909). After about 6 miles you take the exit ‘Laurens’ on your left. Immediately after the exit: sharp turn to the right!! – Ancienne route national- 200m further turn left – Chemin des barraques- After 20m you arrive at ‘lotissement les gênets’ . The second house on your right-hand side is n° 12, your destination. Airports of Béziers-vias, Carcassonne or Montpellier.